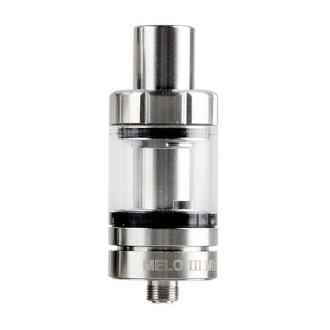 The Melo 3 Nano is the small version of the original Melo 3 Tank. It holds an approximate 2mls of liquid capacity and retains the convenience of its elder. All parts of this atomizer can be taken apart for maintenance and cleaning which keeps the flavor pure and clean. Just like the original tank the Melo 3 Nano can be filled by removing the top cap and letting the liquid slide down its chamber. The Top cap process keeps your battery threads from being stripped and makes for an overall easier refill. At the bottom of the Tank is a hidden adjustable airflow control that can be moved back and forth to regulate the amount of air the tank receives. The Melo 3 Nano is small in size and is 22mm in diameter. It fits perfectly on smaller sized mods and keeps your e cigarette light and breezy for a discreet model with a powerful hit!